Now that the blog has returned, I am going to try to take it in a direction that is not always "in your face" political. You have already seen the Picture of the Week (it came earlier that I expected, but you only see the transit of Venus twice in a lifetime), and now I would like to introduce Sci-Fi Fridays. I follow dozens of different science fiction sites of one kind or another. Rarely does a week go by that there is not at least one interesting tidbit worth enough to share. So this shall be that forum. 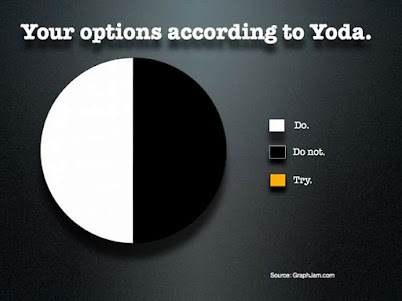 This week I wanted to share something that was sent to me a while ago by a friend: the eternal wisdom of Yoda. Enjoy!